Geo Tours – Georafting whitewater adventures is based in the lovely town of Morrison, Colorado. Morrison is home of the world famous Red Rocks Park & Amphitheater. 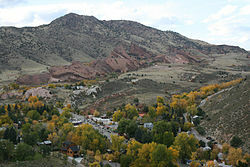 Red Rocks Park is adjacent to Morrison, Colorado, 10 miles (16 km) west of Denver, and is a unique venue where concerts are given in an open-air amphitheater. If you have a chance join the millions of people that have enjoyed this historic music venue. Morrison is home not only to Red Rocks Park and Geo Tours but many other small businesses that offer a true Colorado small town experience. For instance, if you are thirsty and need a cold one to cool off please try Red Rocks Beer Garden located just a few blocks away from Geo Tours’ office. This summer, we are partnering with Red Rocks Beer Garden for our “Boats and Beers Special”. Here is a link to a list of amenities and services available in our great little town. Please feel free to explore the town’s web directory as I am sure you will find many places and locations of interest. Morrison is a remarkable small town steeped in history and lore. I promise you will never regret your visit here. But be careful! Once you visit Morrison you may never want to return home again.